With 10 games on tonight’s NBA slate, we are going to need to find some cheap options all around when we are setting our different lineups. There is plenty of injury information to consider while a few guys are still fairly underpriced. Of course, some of this can change just before game time with starting-lineup changes, but we’ll do the best we can to get you prepared. PG – Zach LaVine $5,000 – The Timberwolves have been getting their butts kicked recently, but because Minnesota has no other PGs healthy and that LaVine needs the experience as a rookie, he’s still logging around 40 minutes per game. LaVine has been posting anywhere from 25-to-42 FPTS in this scenario, so he’s at worst a safe play to meet his salary. PG – Patrick Beverley $5,300 – The good news? The Warriors usually give up a lot of FPTS to PGs. Dwight Howard, Terrence Jones and Isaiah Cannan are still out. Also, and this would be a huge kicker, James Harden was listed as a game-time decision earlier tonight, but now reports are that he’ll play. Since it’s back spasms, that’s something that could limit his minutes if the game ends up being a blowout, which ultimately could give Beverley more minutes with Jason Terry at the 2. This play isn’t as safe as LaVine, but Beverley does have rare legit upside tonight. SG – Alan Anderson $3,500 – Joe Johnson, Brook Lopez and Andrei Kirilenko are all still out while Mirza Teletovic enters the game-time decision category (missed shootaround). Anderson started and logged 32 minutes against the Cavs. While he only posted 15 FPTS, it’s encouraging that Anderson played that many minutes, missed all of his three-pointers and didn’t even record an assist. Essentially, Anderson’s stats on average are better than 15 FPTS on 32 minutes no matter who the opponent is. He’s also minimum salary, which is awesome. SG – J.R. Smith $4,300 – The Spurs are the worst matchup for SGs. But Carmelo Anthony, Tony Parker, Tim Duncan, and Manu Ginobili are all questionable while Kawhi Leonard is out. Add the fact that $4,300 for someone who is shooting a ton and getting 25 minutes a game as it is, this is actually a no-brainer if Melo doesn’t play. SF – Corey Brewer $4,900 – Nothing new here. This is just that Brewer has great upside and he can log a ton of minutes with Minnesota’s injuries. SF – Jay Crowder $3,600 – Crowder is part of the main rotation and is logging about 25 minutes per game. PBetter yet, he’s posting around 1 FPT per minute, which is fantastic for someone coming off the bench and nearly minimum salary. 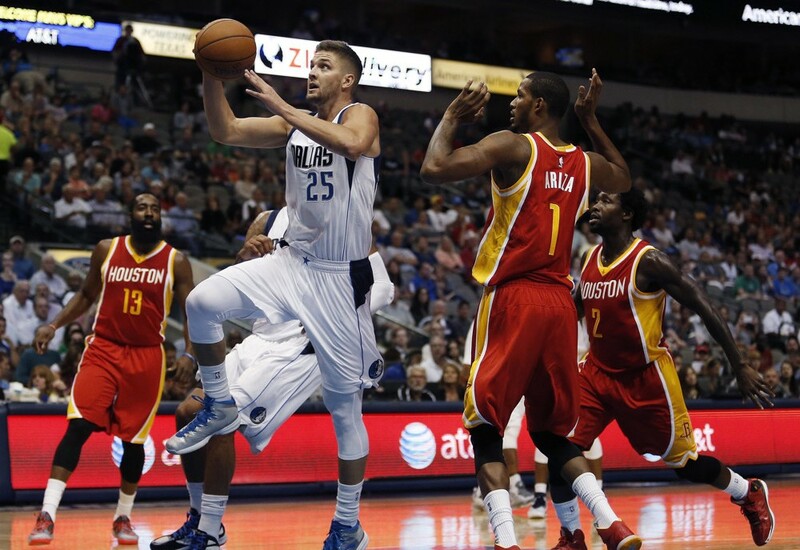 The Mavericks are also -7 at home in a favorable matchup with the Pelicans. PF – Kris Humphries $4,900 – Nene or no Nene, Humphries is the starter and hasn’t lost any playing time. The Magic stink against PFs and is certainly capable of 30 FPTS tonight. PF – Kevin Garnett $5,000 – This is a bit tricky since we don’t know about Teletovic yet and how Lionel Hollins would construct his starting five. To be fair, there isn’t another cheap PF I really like. This is just the best option. Garnett could get 30 FPTS with Teletovic out, but the Nets are 11-point underdogs. C – Dewayne Dedmon $3,900 – Nikola Vucevic is another game-time decision, but luckily this is one of the first games of the night, so we should find out before tip off what the situation is. If Vucevic is out again, we can expect another 20 minutes from Dedmon, who is earning around 1 FPT per minute. Note, keep an eye on the Spurs situation in particular. The Spurs are on the second of a back-to-back, so we know what that means.